News Welcome to Marco Anastasi and Serena Caruso's technical weblog on Microsoft .NET technologies and related matters! 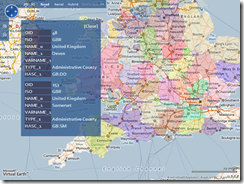 If you've ever tried to find a way to display an ESRI ShapeFile on a Virtual Earth map, you'll have probably noticed how little information there is on the Internet about how to accomplish this apparently arduous task. As a matter of fact, I needed to do exactly this while adding some collateral features to the software Serena and I are developing for our thesis, but after some Googling, I found that there was (and there still is) almost no useful information on how to achieve integration between Virtual Earth and ESRI Shapefiles. By the way, with the technique I'm describing, you're going to be able to not only display Shapefiles as layers on Virtual Earth, but also interact with them in countless ways: extract data from them, show data associated with a shape when you click on it on the map, even modify or create new Shapefiles (Although only showing and querying the map are going to be covered in this post). 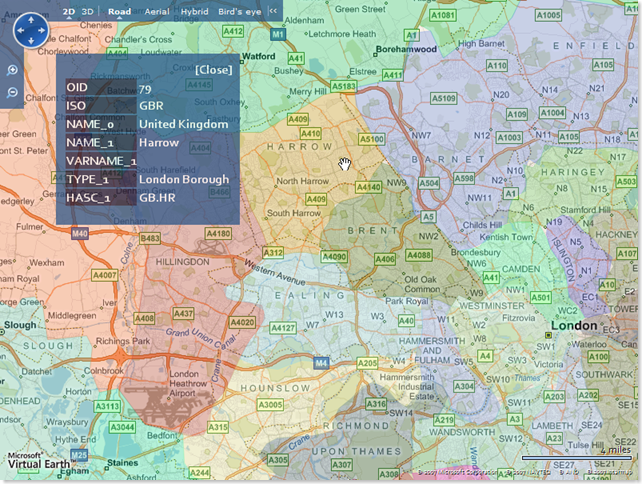 All of this care of SharpMap, one of the best (if not the best) open source .NET libraries for GIS. Actually, SharpMap does much, much more than this... it even has a performing rendering engine for spatial data, so it really is an understatement to think of it as a mere instrument to get ESRI data into our Virtual Earth maps. In fact I strongly recommend to go and give a look at the SharpMap project page on CodePlex. SharpMap 2.0 is currently in beta stage. The currently stable release is 0.9. Version 2.0 beta is not radically different from version 0.9, at least for the parts of the library that we're going to use, so feel free to resort to the stable version if you feel more at ease, but I thought worthy to use version 2.0 beta in my project because of a rather important addition, i.e. 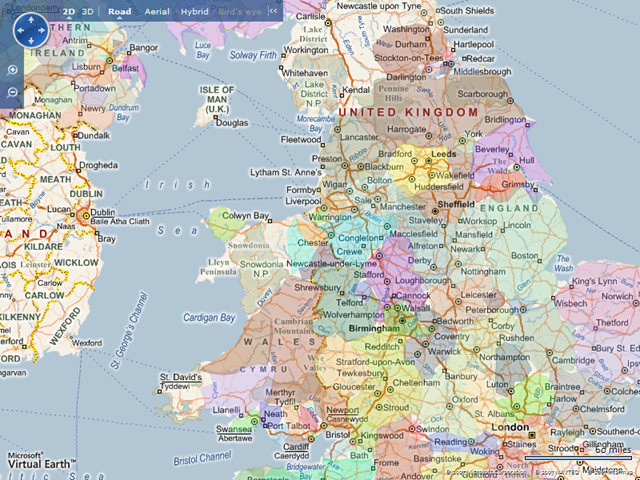 the possibility to write on Shapefiles as well as read them, which to my knowledge wasn't present in the 0.9 version. Obviously, if your application doesn't require to modify or create Shapefiles, you can safely fall back to the 0.9 version. 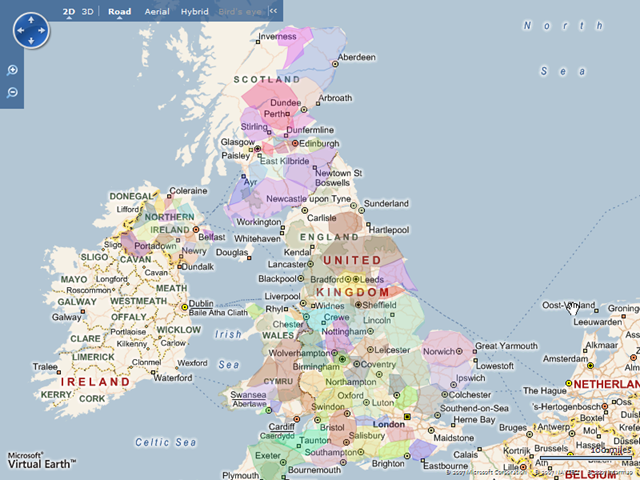 Let's suppose that we have a Shapefile containing polygons which represent the administrative regions of the United Kingdom, and that we want to overlay that on the map. First of all we need to extract the polygon data from the Shapefile, and convert all the polygons to a format readable by Virtual Earth. 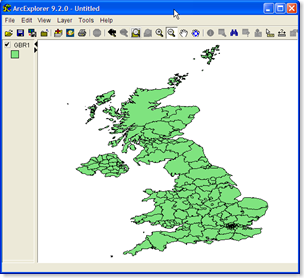 Each "part" in the Shapefile will become a "polygon shape" in Virtual Earth. In this phase, we will leverage SharpMap's ability to parse Shapefiles to .NET objects. /* Verify that the geometry is actually a polygon. If it is not, just skip it. Now that the data is available to the client side, we need to go through all the Shape objects and actually convert them to Virtual Earth shapes. In case of successful completion of the method call, the GetESRIData_success callback will invoke the AddLayer() method, passing it the received object; AddLayer() will perform the conversion before actually drawing the shapes on the map. Now what if we want to access the info associated with each part (i.e. shape) in the Shapefile? Luckily, SharpMap comes once again in our help, making this very easy. When provided with a bounding box, the library's ExecuteIntersectionQuery() method returns a DataSet containing the information associated with the shapes that intersect it. All we need to do to get this info to the client is create another ScriptService, and invoke it when the user clicks on the map, providing the Latitude and Longitude of the clicked point. /* This is the extents of the map upon which we want to perform the query. Finally, this is what happens on the client when the user clicks on a point on the map. Notice how we leverage ASP.NET AJAX's page lifecycle "pageLoad" event to initially setup our map and register the onclick event handler. The rest of this snippet should be self explanatory. In case it is not, you can have a look at Virtual Earth SDK to learn more about map events and methods. As usual, you can see a live demo of the application here, and you can download the source code of this project here. thanks for the suggestion, I'm working on a more complete version of this demo to put online as a Virtual Earth based Shapefile viewer, and I'll definitely use this bit of information to leverage SharpMap's ability to reproject maps! Very interesting article. We've taken a slightly different approach to solve the same issue with Toucan Navigate. You can download it from our web site and see how it compares to your work. 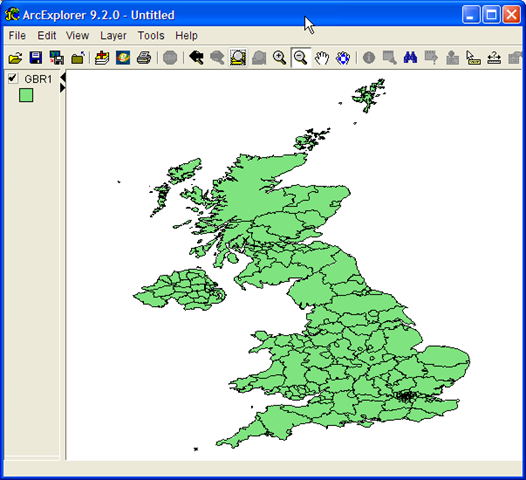 With Toucan, you can keep your ESRI shape files in their current location and overlay them on the VE tiles. it's a very good stuff for ve developes. really i am feel good! How can I add the support the of Polylines to this? Where do you get the Shapefiles from?? I am a novice for these kind of projects, so please help me out. I tried the software and the preloaded shape files worked beautifully. When I uploaded my own shape files I am informed that several shapes are loaded but I can not see them. Do I have to do something to get them colored in some way? It might work with Open Layers with tilecache faster ... haven't tried that .. 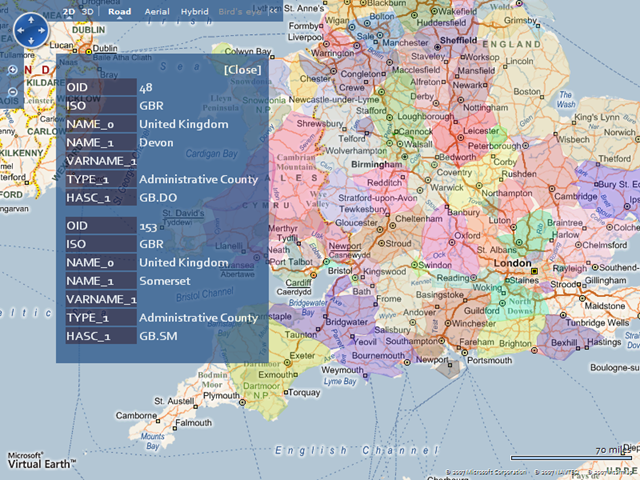 I was able to build the project but could not get it to display my own shapefile. I stepped into the code and could see that it was loading the shapes into the List<Shapes>, but I couldn't see them on the map. I downloaded the SharpMap v2.0 code and imported your project into that one so I could step into the SharpMap code to try and figure out my problem, but I can't get your project to build now. It can't find SharpMap.Geometries assembly. Any idea about that? As I ran your sample code, I got the following error: sf.Locale threw an exception of type System.NullReferenceException. sf.Locale is readonly, so how do I solved the problem? Oh, my bad. I didn't give aspnet permisstion for the maps folder. However, I still can see my shape layer of Alaska quadrangle. As I step through the code, I noticed that the points of the my polygons are in very large numbers, such as lat: 216065 (type long) and lng: -79793.94 (type double). The same shape file works fine with esri stuff but not here. Can anyone help? I want to show my shape file in your project let me know How I can do that. i have a question. is this web service secure? knowing that it use json to transmit the information. what i mean is that can anybody hack the shapefile and take them. could this web service be accessed in a website different from which this web service was created?. For example, a company would like to show her branches on a map using virtual earth but taking the roads from the shapefile of another company. As a college project I am trying to overlay to Electoral Divisions in Ireland onto Google Earth. Basically I want to be able to type in my address, Google Earth to find it, and then to visually inspct what DED I live in. and I was wondering if this is possible? Isn't it a lot easier to convert to a Google KML file (Datum WGS1984) and then load it to Virtual Earth? Just asking. This is my .prj file, but i am not able to read shape file, i got the coordinats like 870555084.7,299403551.2. hoe to convert these coordinates to Lat/Long? Please Help me. 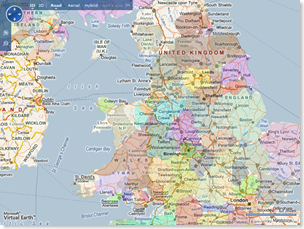 Would you be interested in doing some development work for us along the lines of displaying ESRI shapefiles within an asp.net program running on a server? My query: When I try to upload some of the shape files .shp, .shx, .dbf (Not all) which i have, getting blank page. Could you tell me the reason for this. Iam trying to load the UK shape file on virtual earth. Can you please enable the live demo and source code? I am trying to convert it to asp.net but Can not extract Shapes from shape files. Thank you. When I try to upload some of the shape files .shp, .shx, .dbf (Not all) which i have, getting blank page. While i am trying facing problem.I downloaded SharpMap2.0 from codePlex. But Shape,ShapeFileProvider and ShapefileReader are giving error . I watched the sharpmap.dll in object explorer ,there is no such reference. Thank you for providing a link to the live demo. Way to look out for those of us who are visual learners. Having the option to view the demo for this application made the process a ton easier. I did, however, have issues downloading the source code for this project. If you would, please update the link, or send me some info on how I can acquire it. Is the source code still available anywhere?